On Wednesday, 26 October, 2016, perhaps the deadliest-yet alleged attack on a school was reported in the rebel-held town of Hass (alt Haas, Has - Arabic حاس ) in Idlib province. The attack was said to kill over 30 civilians and no rebel fighters. The dead are said to include at least 22 children, several teachers, and some parents. Opposition activists and "rescuers with the White Helmets" blamed airstrikes, at least two of them, carried out by Syrian or perhaps Russian jets. Russia denies having jets in the area, as does the US-led coalition, who therefore blame Syria or Russia. Haas is located here on Wikimapia, between Maarat Numan and Kafranbel, well south of Idlib city. The damaged school seen by Russian drone is in the town's southeast, labeled complex of five schools on Wikimapia. The plume videos might be filmed from the east edge of town on main street - if they're filmed in the later morning as alleged, the views are to the southwest, atop or over a nearby hill. The plume on the left (further east) is older, the one on the right caused after a long delay. The dubious scenes with victim rescue might be in the orchards area south of the schools. The top view here (from Twitter) matches the Russian drone view to part of the school compound using a video still. The lower view (ACLOS) compares several views with this area, and the next school south, where mot damage views are actually from (note: the Minaret also lines up perfectly - it's 380 meters to the west-northwest). So far we have no matching drone footage for this damage to show if there is or isn't a crater (note: there seems to be a sizeable crater whee the corner of the wall once was - yellow circle). 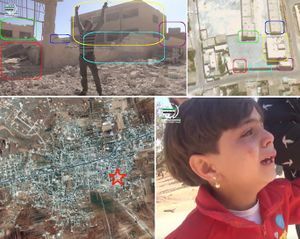 According to the SNHR's report, the northern school seen by Russian drone is Martyr Kamal Qalaji primary school - the widely-seen site to the south is Hass preparatory school for girls. The other, perhaps unseen, to the west of that, is Hass preparatory school for boys. At least 26 civilians, including children, were killed when air raids hit a school and the surrounding area in Syria's northwestern Idlib province, a monitoring group said. 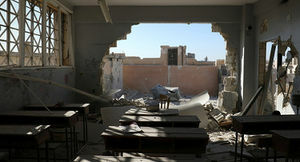 The Syrian Observatory for Human Rights (SOHR) said on Wednesday that the bombing was believed to be carried out by Russian planes and targeted the village of Hass, including the school complex. "The dead children are students and the planes are believed to be Russian," said Rami Abdel Rahman, head of the Britain-based SOHR, which relies on a network of informants in Syria to track the war. The raids hit the village around 11:30am (08:30 GMT), an opposition activist with the Idlib Media Centre, told the AFP news agency. "One rocket hit the entrance of the school as students were leaving to go home, after the school administration decided to end classes for the day because of the raids," the activist said, speaking on condition of anonymity. Abd, who did not want his second name used, was near the village when the airstrike occurred. He told BuzzFeed News, via a messaging service, that when he got there it was “horrible.” “There was blood and damage everywhere,” he said. Abd, who was studying at university before the war, also visited the school, which he said had been hit just as the school day was finishing — and reduced to nothing. “It [the airstrike] was for killing the children only,” he claimed. BEIRUT — Syrian activists say that airstrikes outside a school in the northern, rebel-held province of Idlib have killed 17 people, mostly children. The Idlib News network says the airstrikes hit as the children gathered outside a school complex in the village of Hass, in northern Idlib, on Wednesday. Air strikes that hit a school in Syria's rebel-held Idlib province on Wednesday killed 22 children and six teachers. Local groups said the air strikes were carried out by warplanes that were either Russia or Syrian. UN Secretary-General Ban Ki-moon demanded an immediate probe into the attack which he said "may amount to a war crime". 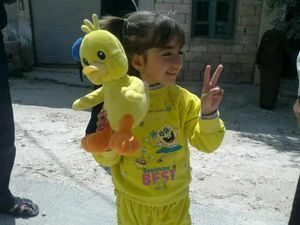 (HAAS, Syria) -- A fourth-grade girl known for her intelligence and who was her parents' only child was among more than three dozen people, including 15 children, killed by airstrikes in a school compound in Syria on Wednesday. The parents of the girl, Bisan Khaled al-Farahat, had trouble conceiving and tried for years before she was born, residents of the village of Haas south of Idlib told ABC News. "The whole neighborhood knows her, and we were all very affected when we learned of her death," Ayham Abdullah Alsheekh, a local resident who knows the family, told ABC News. "She was very clever. She was maybe 10 years old, but mentally much older. Everyone liked her and she was spoiled." The report says that at 10:52 approximately, two “SU22” fixed-wing government forces warplanes targeted the southern neighborhood in Hass village where the Martyr Kamal Qal’aji school complex is located. The complex contains three schools. The bombing lasted for 20 minutes during which the warplanes dropped no less than nine missiles carried by parachutes. The report documents the killing of 38 civilians including 18 children and six women. Among the victims were four members of the teaching staff and 14 students. Includes RU MoD response, and an interview with former Pentagon official Michael Maloof. 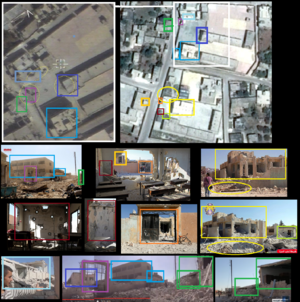 The Russians took drone footage after the news broke, and decided it shows some damage, as site photos do, but the images and/or video might be misleadingly edited, and the damage seen is too small and not enough to the roofs to have been an airstrike. Russian MoD believes that the video consists of over 10 glued together pieces, shot with different resolution and at different times of the day. On 26 of October, no Russian plane was in that area. Subsequent drone photos did not confirm traces of aerial bombardment of the school. The video obviously consists of several pieces, with lighting/weather looking quite the same. The guy starts running without a backpack, towards explosion quite far away. He ends up arriving (somewhere) with a backpack. Unclear what video RU MOD describes. https://twitter.com/bdrhmnhrk/status/791252007139078144 Mohamad Rahmoun was killed by the airstrikes on Hass school. His father has been imprisoned by regime for 5 years. The opposition VDC records 38 Idlib civilians killed Oct. 26 by airstrikes, all from or killed in Has, with bombing blamed on "Syrian government and affiliated militias." Notes: "Due to the regime air forces' "sukhoi" shelling with missiles loaded with a parachute." breakdown: 10 girls, 6 women, 5 boys, 6 unidentified (perhaps fragments, gender unclear/unknown, listed as men, meaning blank), 11 identified men. Some parents and children, apparent siblings, male and female teacher with the same family name, etc. “The Human Rights Watch publication of yet another accusation of a ‘war crime,’ which comes more than a week [after the incident] and contains some phone ‘interviews’ with seven victims as new ‘evidence,’ does not hold up to criticism and is just another information attack,” Russian Defense Ministry spokesman Major-General Igor Konashenkov said in a statement on Monday. This page was last edited on 8 November 2016, at 00:16.